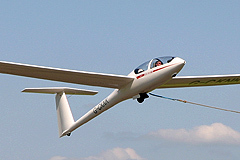 The Cotswold Gliding Club was formed in 1964 and initially the club was based at Long Newton airfield near Tetbury. In 1967 the club moved to its current home, Aston Down, which at that time was a military airfield. In 1981 the airfield became surplus to requirements and was sold by the MOD. With the help of Sports Council grants and other loans the club managed to purchase a large part of the airfield. We have since aquired further land and now own most of the airfield within the perimeter track. Aston Down is, by gliding standards, a large airfield The 1500m main runway - about a mile - offers scope for high launches, sometimes up to 3000 feet when the wind direction is straight down the runway. This makes it easy to contact the abundant thermals that rise from the well drained Cotswold limestone to give superb soaring conditions. The picture shows Aston Down taken from the South. The main runway runs from bottom left to top right and our shorter 1000m east-west runway runs left to right. The disused runway in the distance has been partly removed to allow more room for gliders landing on the grass. The large hangars you can see were used by the MOD until 2001 but they have now been sold and are currently let as warehousing and industrial units. Aston Down was first used as an airfield in the first world war, when the Australian Flying Corps were based here. During the second world war the hard runways and hangars were built and the airfield was used as a ferry and training base. Have a look at these pictures from 1918 and 1946. More recently the airfield was used as a satellite airfield for the Central Flying School at Little Rissington, with trainee pilots practicing their circuits in Jet Provosts. Visits by the Red Arrows were also frequent when they were based at nearby Kemble airfield. The club's fleet of aircraft is maintained to a high standard and includes two ASK21 dual seat trainers (G-CLRT, G-EENK), a Ka13 dual seat trainer (G-CFWB), a DG500 advanced trainer (G-CKNK), an ASK23 for early solo pilots (G-CGCF), plus an Astir (G-CHJV) for more experienced pilots. Since buying the airfield dedicated work by club members has resulted in improved and expanded facilities. The original control tower houses a large, comfortable club room (see picture) with licensed bar, and a well equipped catering kitchen - with food and beverages available for members and visitors to prepare for themselves. A modern extension to the control tower houses purpose built residential accommodation, plus excellent toilets and showers. The accommodation may be booked in advance through our office. We are well equipped for flight planning with access to soaring weather forecasts, NOTAMS and flight planning and analysis software. We have free wireless (and wired if required) broadband internet access. Next to the control tower are caravan and camping facilities, with pleasant views across the airfield. Glider launching is mainly done using our two powerful Skylaunch winches. Aerotow launching is occasionally used, particularly when the wind direction means that the Cotswold ridge is providing lift or the Welsh mountains are generating wave lift. We have a large hangar that accommodates the club fleet and many gliders owned by club members. We also have two large purpose-built workshops for maintenance of our aircraft, vehicles and winches.